Tags: agriculture, agroforest, Cacao, Chocolate, cocoa, cocoa beans, cocoa production, food supply, goodfood, goodhealth, goodmedicine, goodscience, harvest, monocultural grove, nutrients, nutrition, research, superfood, Theobroma cacao L.
(Natural News) A bite of your favorite chocolate bar can take off the stress for most people – studies have already looked into it – but research has shown that putting cocoa trees under stress can lead to better-tasting chocolate. In particular, drought and other weather conditions have more impact on cocoa production than how the tree themselves are grown. 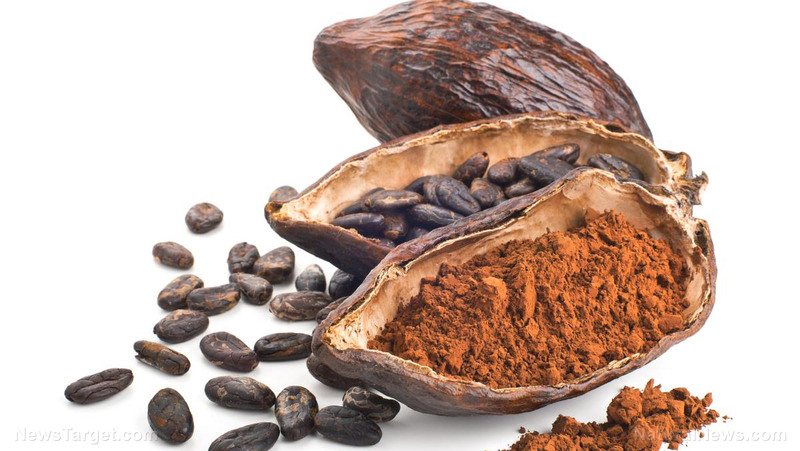 The report, published in the American Chemical Society’s Journal of Agricultural and Food Chemistry, detailed the impacts that different cultivation methods have in the chemical composition – as well as the flavor – of cocoa beans. Chocolate is the most famous derivative of the Theobroma cacao L. tree, commonly referred to as either cocoa or cacao. Studies have revealed that regular consumption of cocoa protects against inflammation and oxidative stress. In the central nervous system, cacao was shown to improve blood flow to the brain, which can protect against neuronal injury. When used topically, it protects the skin from damage caused by ultraviolet (UV) light. However, cocoa, when consumed in chocolate, can have adverse effects on a person – including weight gain and gastroesophageal reflux disease (GERD). Scientists have been quick to point that there is still benefit in consuming moderate amounts of cocoa or dark chocolate. There are two different ways of growing cocoa. The first method, called agroforestry, involves raising cocoa trees in mixed groves. This allows the plants to receive cool air, as well as vital shade, allowing for a low-stress environment. The other method involves planting trees in singular, “monocultural,” groves, to produce more yield. This exposes trees to elevated levels of stress. To counter this effect, trees produce antioxidants to react against the stress and minimize the damage. However, the increased amount of antioxidants also affects the quality of the beans. To understand the process behind it, researchers sampled beans from five different cocoa tree farms in Bolivia. The samples were collected from both monocultural groves and agroforest settings and were gathered at the beginning and the end of the dry season. Before its analysis, the beans were fermented and dried. The researchers found only minor differences in the chemical composition between beans that were cultivated in an agroforest and a monocultural grove – with beans from the latter having more phenols and antioxidant compounds. What they found to be significant, however, was the effect that weather has on the beans’ chemical composition. During the dry season, the rise in temperature causes soil moisture around the trees to drop. This lead to an increase in antioxidant levels in the beans, as well as reduction of its fat content. The authors of the study said that these factors, which elevate the stress levels of the cocoa tree, can add to the variability of the flavors of cocoa beans. The results of this study challenge assumptions made by climate change proponents about the possible extinction of cacao trees. According to them, the trees will die out as temperatures increase, causing warmer and drier conditions that will make cultivation of the trees impossible. Did you know that cocoa has the highest amount of phenolic antioxidants than almost any other type of food? Learn more facts about cocoa and how it benefits you by heading to Chocolate.news today. Next : Could a colonoscopy put you at risk for appendicitis?